How to become an account manager when no one will give you a break? Where do you even start? 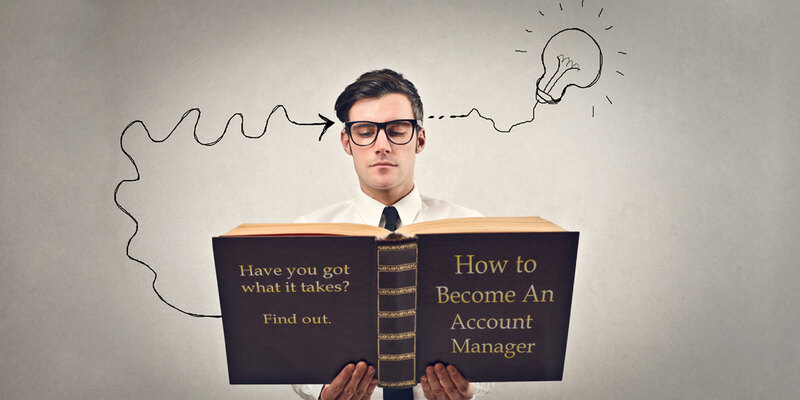 What does it take and what to do you need to know to become an account manager? Targets are usually based on a forecast that your company wants to achieve. Account management is also highly relationship and service driven. You’ll need to meet lots of different people within your client base, from users to decision makers, influencers to CEO’s – the more people you meet, the more opportunity you’ll have to improve loyalty and sell more stuff. You’ll also frequently be involved responding to queries and complaints. Depending on the type of account management and the industry you may have anywhere from one to more than a hundred clients and they might be in your country or anywhere in the world. It’s a great career, very exciting and rewarding because you truly get to know your client and understand what they do, what their challenges are and how you can help. Of course, that’s the simple version, but you didn’t come here to read War and Peace did you? What qualities do you need to become an account manager? Don’t worry, these can all be learned. Let’s find out how. There are lots of different types of account managers. From telephone based to field-based; local to global. Start with a search for key account management jobs on LinkedIn – pick a few you like the sound of and write down the responsibilities and skills they’re looking for. Keep looking at jobs until you have a list of 30 things you don’t know about account management. What do you already understand about this role and what do you need to find out? Then start to do your research on every topic until you have the answers. Save any jobs you’re interested in. Copy and paste into a word document or save them as a PDF. Don’t bookmark them as jobs postings often get deleted once the position is filled. These job descriptions will be invaluable later when you are updating your CV. What skills do you have now? What skills do you have, but need to improve? What skills don’t you have? Write down all the career stories you have about times when you’ve demonstrated those skills – even if it wasn’t as an account manager. Practice those skills in your role now. Think outside the box. Maybe you could practice your communication skills by volunteering to chair team meetings or give your next update to your boss in a presentation instead of just a chat over coffee. If you have no idea, ask your colleagues or your boss what you might be able to help with or how you can adapt your existing responsibilities to learn these skills. A great place to start in your quest to become an account manager is to seek out a mentor. Hit someone up in your company with the relevant skills and ask if you can spend some time with them every month to learn about their job. If you don’t know anyone or don’t want to ask, mention to your manager what your career goals are and ask if they can help you set up a mentorship. Mentorships aren’t just for newbies. All of us, at any age and any point in our careers can benefit from a mentor. So don’t be shy about asking because you think your too junior or too senior to need a mentor. I have gained so much wisdom from colleagues and I think we underestimate the power of peer learning and mentorship. How’d they get into account management? What’s their advice on what it takes to be a great account manager? What are they skills they think are essential and how did they acquire them? Think about situations you’ve encountered and ask them for their perspective and how it might impact a client. Ask if you can shadow some of their client calls (many of them are probably by conference call where you can listen silently) – then ask them questions about what you heard on the call. TRUE OR FALSE: You can’t learn on-the-job skills when you’re not doing the job? There’s no avoiding the fact that there will be some core skills you lack. You can wait to learn them on the job (which might take years… or never) or you can fast track your learning and take a course. It’s also super-impressive when a candidate says they’re passionate about a career in account management and accelerated their learning by taking a few courses. You need to differentiate yourself from the pack of other would-be account managers and this is an easy way to do it. There’s plenty of quality free courses on offer. eDx and Shaw Academy are favourites of mine. A lot of them only take a few hours. A small investment in time if you want a new job, don’t you think? Check out my Trello board with the top skills account managers need including links to free courses and an account management career development action plan. It’s important to stay informed of business trends and developments. Account managers should be able to understand the impact of world events, how they relate to their clients and the opportunities – and risks – they present. Accenture, BCG and Deloitte regularly release studies on emerging trends. Now that you’ve learned a few skills and have some great examples of success to share, it’s time to update your CV so that it reads like someone with account management expertise (even if you don’t have the experience just yet). Remember when I asked you to save those jobs you liked? Look at the qualifications and the skills and make sure you have included these in your CV and use the exact phrases and verbs from the job description. When you say you have a skill be sure to include a great result you achieved because of it. Now the hard part: you MUST change your CV for every job you apply for. The keywords, responsibilities, qualifications and experience will vary. You need to make it easy for the hiring manager – or the applicant tracking system – to connect the dots and to see how relevant you are. If you include a lot of things they’re NOT looking for, it’ll be that much harder for them to see the experience on your CV they ARE looking for. You don’t know what the recruiter is looking for or how flexible they are with the requirements. Many times I’ve been open to hiring someone from other industries because I wanted a specific skill and knew I could coach them where they needed development. Sometimes it’s about the budget. Quite frankly, someone who doesn’t have all the skills or has never done the job before is a lot cheaper than a hotshot account manager with loads of relevant experience. You have no idea how many applicants there are or what their background is. I’ve been looking to fill some very senior and well-paid jobs that haven’t attracted a single candidate that fit the profile. I’ve had to reconsider what I’m looking for and sometimes a senior job gets turned into a junior job because that’s all who applied. This happens a lot when an existing role is vacant and someone is doing the job of two people. You can only wait so long. Who says you’re even going to get the job? You’ve got a long way to go from application to offer, so don’t talk yourself out of it before you’ve even had a chance to be considered. Don’t apply for every job under the sun. Not only is it a waste of time, it’ll mess with your mind. Stick to jobs you are genuinely interested in. Be realistic. If you’ve never had a job in account management, you may need to consider more entry-level roles, like telephone, virtual and inbound account management. Consider hybrid roles. My first account management role also included operations and office management. I was only in it 12 months before I caught a big break. You might need to take a pay cut. When I moved from operations to account management I took a $20,000 drop in salary (even though I was customer facing and had managed 45 staff). But I knew this was a long-term career move and that I would eventually earn that money back. Beware of applicant tracking systems, which is automated software many companies use to screen candidates. It searches for keywords and if your application doesn’t have the right ones it will never see the light of day. Check out JobScan which has amazing software that scans your CV or your LinkedIn profile and gives recommendations to ensure it’s a match for the roles you’re applying for. CV Wordchecker is another great resource. That’s up to you. All I can say is prepare, prepare, prepare. Make copious notes, bring them to the interview and make sure you have at least half a dozen questions you want to ask. The more you understand what an account manager does and demonstrates that you have the skills or are learning them (even if you don’t have the experience) the more you’ll impress hiring managers with your abilities and I’m sure a career in account management will find you before long.